Cabot High School student-athletes were “Loving LIFE” after signing to play their respective sport on the college level: Connor Gaunt (from left), Izzy Dulin, Zach Morris, Blaine Calhoon, Zack Slunder and Sami Romano. 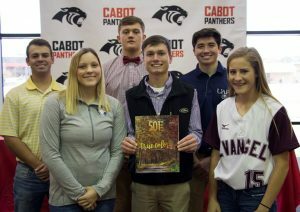 Six Cabot High School student-athletes were surrounded by family and friends as they signed letters of intent to play sports at the college level next fall. Connor Gaunt – Golf, Arkansas Tech University. Izzy Dulin – Swim, Williams Baptist University. Blaine Calhoon – Golf, University of Central Arkansas. Zach Morris – Baseball, University of Arkansas. Sami Romano – Softball, Evangel University. Zack Slunder – Baseball, University of Arkansas at Fort Smith. Blaine, a son of Brian and Renee Calhoun, is looking forward to continue his golf career and to play with some of the best golfers in college. Blaine chose UCA for the overall college atmosphere and is excited to work with the new staff and team. Blaine has been golfing from a very young age and was part of the 2018 Boys State Championship Team. He was also the 2018 Top Individual Medalist. Connor, a son of John and Monica Gaunt, is excited to play golf at Arkansas Tech. He is looking forward to the collegiate level for the competitive playing experience and amazing coaching staff. Connor was also part of the 2018 State Boys Championship Team and was named All Conference and All State for three years. He was also named the ASGA Player of the Year two years in a row. Connor plans on majoring in business and marketing. Zach Morris, a son of William and Stacy Morris, has played baseball since he was 4 years old and continuing to play at the University of Arkansas is a dream come true. He is also excited to play in the SEC. He plans to study kinesiology and physical therapy. He was a member of the 2017 State Baseball Championship Team. Zack Slunder, a son of Scott and Robyn Slunder, plans on majoring in business administration while attending college and is looking forward to the new experience and challenge in his life. Zack played on the 2017 State Baseball Championship Team and was All Conference. Sami, a daughter of Anthony and Terri Romano, signed to play softball at Evangel University. Sami fell in love with the Christ-centered campus and said it felt like home. She is excited to meet her new team and make new friends. Sami plans on studying allied health and science and is looking forward to all the activities the school has to offer. Izzy, a daughter of Shawn and Charity Dulin, signed to swim at Williams Baptist College. She plans on majoring in education and is looking forward to the college’s outstanding education department. Izzy has been swimming for nine years and last year finished third place overall at the state championship in the mile swim. She has also qualified for state championship meets for Cabot and her USA club team in both long and short course for the past five years.